In an article published today in the journal Scientific Reports, the researchers go against conventional wisdom to show that each neuron functions as a collection of excitable elements, where each excitable element is sensitive to the directionality of the origin of the input signal. Two weak inputs from different directions (e.g., "left" and "right") will not sum up to generate a spike, while a strong input from "left" will generate a different spike waveform than that from the "right". "We reached this conclusion using a new experimental setup, but in principle these results could have been discovered using technology that has existed since the 1980s. The belief that has been rooted in the scientific world for 100 years resulted in this delay of several decades," said Prof. Kanter and his team of researchers, including Shira Sardi, Roni Vardi, Anton Sheinin, and Amir Goldental. The new results call for a re-examination of neuronal functionalities beyond the traditional framework and, in particular, for an examination into the origin of degenerative diseases. 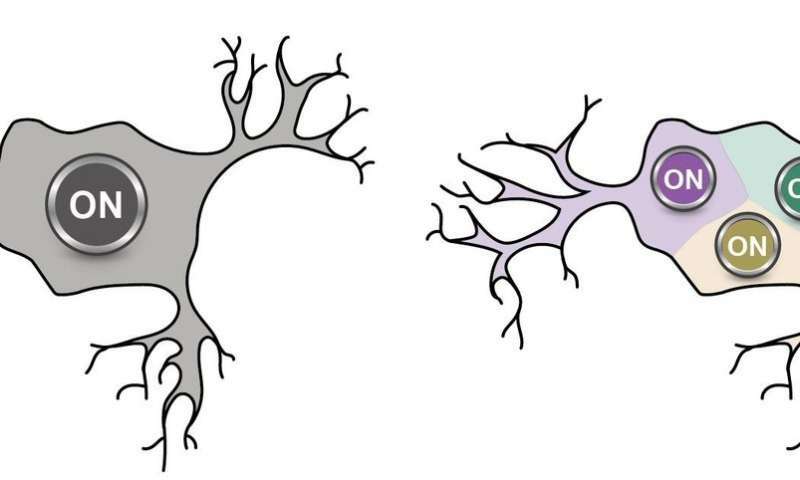 Neurons which are incapable of differentiating between "left" and "right"—similar to distortions in the entire human body—might be a starting point for discovering the origin of these diseases. The new realization for the computational scheme of a neuron calls into question the spike sorting technique which is at the center of activity of hundreds of laboratories and thousands of scientific studies in neuroscience. This method was mainly invented to overcome the technological barrier to measure the activity from many neurons simultaneously, using the assumption that each neuron tends to fire spikes of a particular waveform which serves as its own electrical signature. However, this assumption, which resulted from enormous scientific efforts and resources, is now questioned by the work of Kanter's lab.